We don't have any trips to United States at the moment . Depending on how the dollar is at the time that you plan to travel to the United States, this country can be a real paradise for shopping. Especially if you travel in December, where many stores have already put the sales on for Christmas. The US has a large number of outlets scattered throughout the city where bargains are easily found, especially for clothes, sporting goods or electronics. 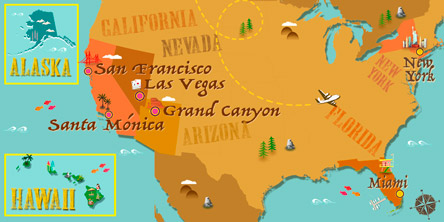 The most visited store by the traveller in any part of the American country is usually Levi's. This firm always has discounted prices. Perfumes are another of the most purchased goods in the country, because they are often cheaper, especially if you buy them in large shopping centres. Also electronics: photo cameras, video cameras, and laptops are also usually cheaper. The best cities in the United States to go shopping are Los Angeles and New York because that is where there is more competition and a lot of bargains to be found. If United States has caught your attention, leave us your number so we can call you to discuss the voyage that awaits you.